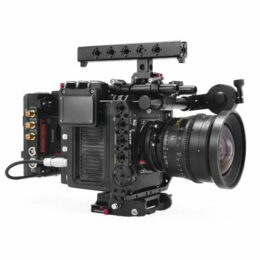 This 4×5.65 carbon fiber matte box is designed to attach to the lens itself instead of onto the camera’s rod system in order to be as lightweight and unobtrusive as possible. However, it comes with an optional 15mm rod attachment if you wish to attach to the rod system. It also comes with several different sizes of lens adapter rings to fit most front diameters of lenses. These adapter rings not only allow the matte box to directly attach to the lens itself but it also forgoes the need for lens donuts. Included in the package is one top French flag to provide flare protection.